The article lists some healthy and quick dinner recipes, which you can prepare in less than 30 minutes. The article includes quick vegetarian and non-vegetarian recipes, soups and salads. 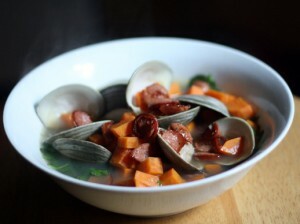 There is nothing like a bowl of clam on a summer night. This dish uses just six ingredients and still feels complete. Rich, smoky flavored bacon is combined with sweet potatoes, clams and Andouille for a full flavored treat. This feel good meal will keep your family members asking for more. The addition of white wine, tomato paste and red pepper flakes will transform it into an even more spectacular dish. Get recipe HERE. 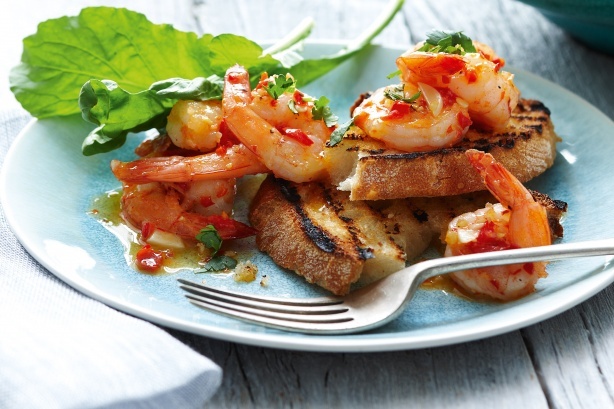 Prawns are versatile seafood. Bake, fry or grill they taste amazing in any form. This prawn is extremely easy to prepare and is done in just 10 minutes. The prawn should be marinated so that you can skip the extra preparation time required. 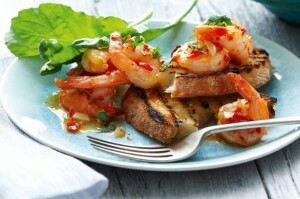 The prawns are stir fried with garlic and chili and are topped with lemon and herbs to make a refreshing dinner. Use fresh prawns to get sweet and succulent results. This dish will go best with rice. Get the recipe HERE. You must have tried the regular chicken soup made from chicken simmered with other ingredients. 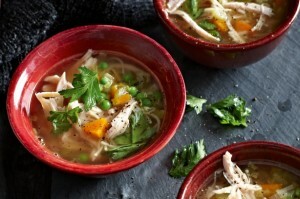 Smoked chicken noodle soup is a chicken soup with a twist. Boiled noodles are added to the chicken soup for a more filling meal. This chicken noodle soup is way tastier than canned or powder soup. The soup has shreds of meaty chicken, noodle and a rich broth. This soup is excellent for health as well. It is high in protein and is used to treat cold and flu. This is a comforting dish on a cold, winter night. Get the recipe HERE. Caesar salad is always a winner. It is the standard item in most of the restaurant menus. It takes minimal time to prepare and tastes sumptuous. Caesar’s salad as we all know is attributed to restaurateur Caesar Cardini. 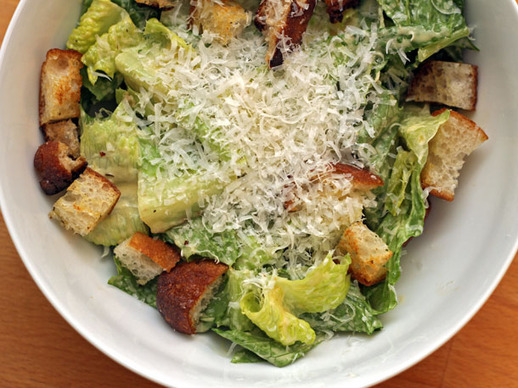 Ferran Adria’s Caesar salad combines garlic, anchovies and chicken for a delicious treat. The salad is dressed with lettuce, parmesan cheese, croutons, olive oil, egg and black pepper. You can also purchase pre-made Caesar salad dressing from the grocery store. Get the recipe HERE. This is the best bet for nights when you are confused regarding what to cook. 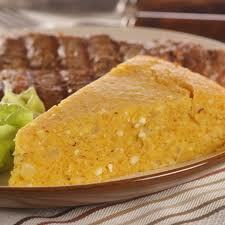 The dish uses some of the most common ingredients found in the kitchen like brown sugar, dry mustard and onion powder. The dish is mildly spiced and can be enjoyed by the kids. The addition of brown sugar and tomato paste balance the taste perfectly. Get the recipe HERE. Chicken Soup with Mini Meatballs from Spoonful.com This is a traditional dish and is fondly called as the Italian Wedding soup. It is a delicious food made by combining meatballs, veggies and chicken stock. The soup is richly flavored with spices and herbs. Simmer the meatballs in broth along with cloves, cinnamon, ginger, garlic and lime. The spoon-sized meatballs in this soup are hearty enough to make a satisfying supper. 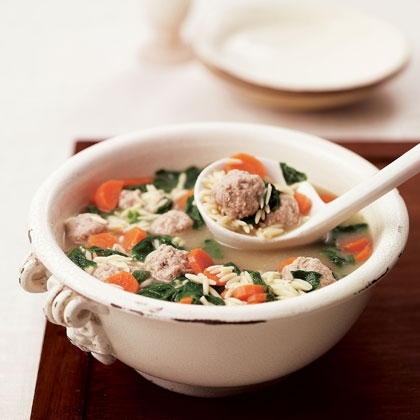 Chicken soup with mini meatballs is perfect for the chilly nights. Serve it over eggs or vegetable noodles. Get the recipe HERE. 7. 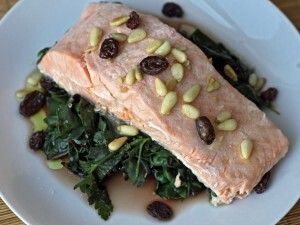 Steamed Salmon with Raisins, Kale and Pine Nuts from seriouseats.com Steamed salmon with rice is one of the healthiest meals you can have. Salmon is great for steaming as it stays moist and cooks fast. Kale, raisins and pine nuts add crunch and sweetness to the salmon. You can cook the salmon in the oven or the barbeque. The fish is seasoned with tasty garlic oil and lemon. Blanch a few florets of broccoli, toss it with sesame seed, soy sauce, and ginger dressing for an accompaniment. You can serve it as a side dish or as a healthy meal. 8. 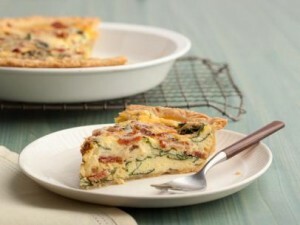 Bacon and Spinach Quiche from foodnetwork.com Quiche has been a popular dish for over a hundred years. Spinach and bacon are an excellent combination for quiche. The smoky flavor of bacon complements the earthy taste of spinach. You can add any of the toppings of your choice to make it more palatable. You can also store the quiche for a few weeks. Wrap the quiche in an aluminum foil and freeze for a few weeks. To reheat, unwrap it and bake in a preheated 325 degrees Fahrenheit for about 40 minutes. This savory pie is perfect for dinner. 9. Thai-Style Fried Rice from erecipe.com As the name suggests, Thai fried rice is a staple food of Thailand. It is a wonderful rice dish made by stir frying rice with vegetables, meat, pineapple and prawns. This easy version of Thai fried rice uses eggs, vegetables and fish sauce. You can also add chicken or beef to make it more satisfying. Adjust the spices according to your own taste. The recipe is quick and can be made with any ingredient found in the kitchen. 10. Butternut Squash & Tomato Posole from eatingwell.com Posole is a traditional Mexican stew prepared with pork and dried corn kernels. The stew is cooked in chili-based sauce. 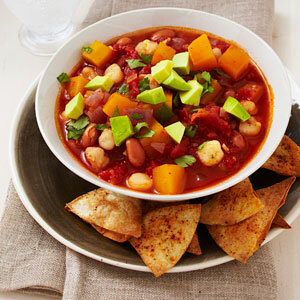 This is a quick vegetarian recipe, which uses tomato, butternut and pinto beans as its active ingredients. Serve it with garlic bread for a satisfying dinner. 11. Cheesy Corn Casserole from Paraguay from tastebook.com Cheesy corn casserole is a favorite of most of us. This casserole is less dense than the regular cheese and corn casserole. This comforting dish will go best with sandwiches. You can also add diced jalapeno to the casserole. Make it as a side dish for the Sunday dinner. 12. 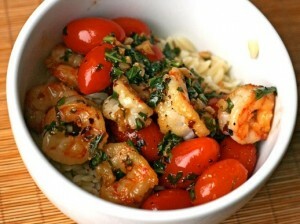 Garlic Shrimp with Basil, Tomato and Pepper Flakes from seriouseats.com This easy to make shrimp dish is a classic and takes just a few minutes to prepare. It is made with lots of garlic, grape tomatoes, butter, lime juice and basil. The sweet burst of grape tomatoes and fragrant basil freshens up the mind after a long, tiring day at the office. Serve it with hot, cooked rice for a pleasing meal. You can also add crushed red pepper if you like spicy foods. The natural sweetness of shrimp heads will add depth to the dish. 13. Dan Dan Noodles from thenoodleguy.com Dan dan noodle is a traditional Chinese dish consisting of spicy sauce, pork and vegetables. The dish is renowned for its intense spicy flavors. It is the spicy sauce, which makes the dish so addictive. 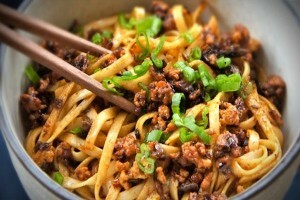 This is a slightly Americanized version of Dan Dan noodles and comes together in less than 20 minutes. The technique involves using high heat and working quickly. You can also add sesame paste or peanut butter to mellow down the hotness. 14. Turkey Pilaf from blog.fatfreevegan.com Pilaf is famous all over the world as a side dish with poultry meals. 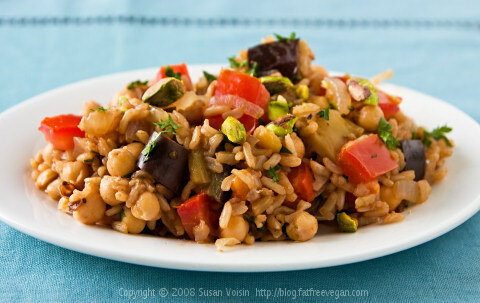 The word pilaf is used in Turkey to describe the whole range of dishes made with rice. It is cooked with lentils, butter, chickpeas and vegetables. The grain must be tender and the rice should not be sticky. This sumptuous dish will make even the fussiest eaters love it. 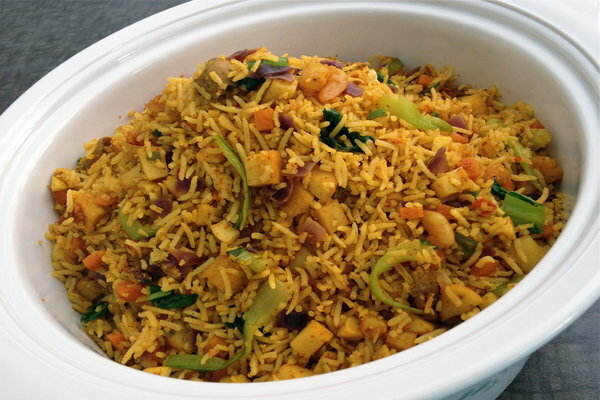 Turkey pilaf will efficiently utilize the leftover Thanksgiving turkey. The leftover meat should be reheated until it is piping hot. The dish should not be heated more than once. 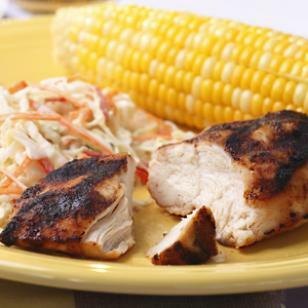 Serve it with the grilled meat. A few mouths of this generous dish will fill you up quickly. 15. 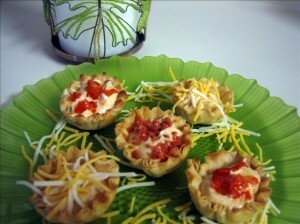 Tiny Taco Tarts from food.com Taco shells are easily available in supermarkets. Fill these mini phyllo shells with the delectable sour cream dip. Keep these taco tarts as a side dish. 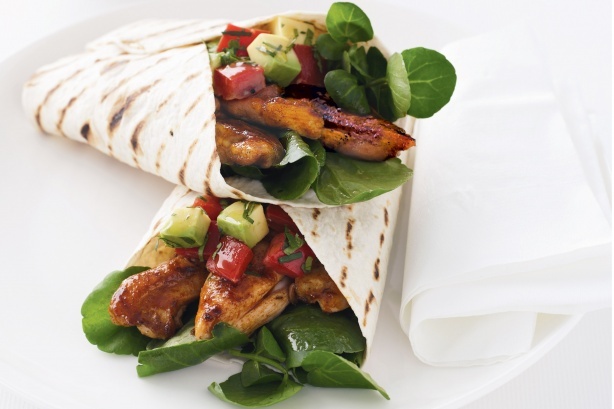 These tacos are easy to prepare and look very pleasing. The fillings can also be served as a dip with vegetables and crudités. 16. Stuffed-Crust Veggie Pie from spoonful.com Vegetable pie can be made in a host of different ways. 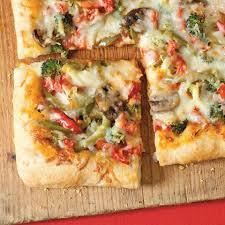 Stuffed crust veggie pie is made with an assortment of mixed vegetables, cheese and herbs. This cheese filled crust pie is extremely appetizing. The pie will surely tempt the kids with its appealing looks and great taste. It is perfect for cold, wintery nights. Serve the veggie pie with creamy mashed potato. 17. Chicken fajitas from taste.com Chicken fajitas are perfect for summer suppers. Marinate the chicken and leave it for a few hours. Cook it with green vegetables to make it more satiating. You can also add some lime and orange juice for a tangy touch. Serve fajitas with soup, dips or guacamole. Garnish it with cilantro and minced garlic.